With perhaps some of the most dramatic and transformative character arcs in young adult fiction Brent Weeks has made Way of the Shadows killer read. 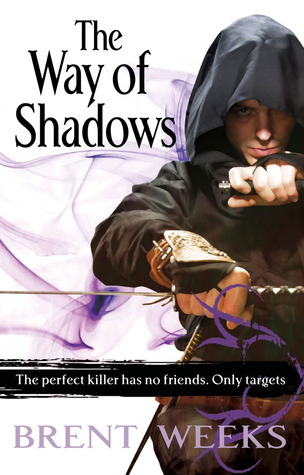 Way of the Shadows follows the young street urchin Azoth (Or Kylar as we come to know him) in the crime-wrought fantasy city of Cerna as he is apprenticed to Durzo Blint – the city’s best Wetboy (Magic-using assassin). Azoth has a struggle to pull himself out of the gutter – every day he and his best friends Jarl and ‘Doll Girl’ are terrorised by their guild leader – a terror named Rat. While Azoth kills Rat in order to prove himself to Durzo it isn’t before the monster has left both physical and psychological scars on both his friends and himself. As the novel progresses into its second act and Azoth is made to abandon his old life by his new master and become ‘Kylar’ in order to pose a young nobleman and befriend Logan Gyre, a cousin of the King and popular knight likely to be the next king. Through this second act we start to see that Way of the Shadows is all about character transformation and metamorphosis. Kylar becomes more and more of a wetboy, following in his new master’s footsteps in learning poisoning, weapon mastery and stealth but still he struggles with magic, eventually learning that while repository of magic within him is huge, the conduit that would allow him to use it is broken. Thus Kylar focuses more on his physical skills, not relying on magic as other wetboys do. His fake friendship with Logan soon becomes a real one as the strong and loyal young noble comes to count Kylar as his closest friend. While this is going on Jarl and Doll Girl go through their own transformations – Jarl becomes a prostitute for a short while but soon his guts and determination turn him to managing the brothels across the city and he is eventually approached by the Mysterious Momma K, who runs the Sakarge, the giant crime gang that basically controls the city in order to be her successor. Elaine becomes a serving girl and is eventually adopted in a high class family – when Kylar comes to see her after years apart she is no longer ashamed of the giant scars that mar her otherwise very beautiful face but she embraces them as part of her. The book enters its third act as the warmongering nation of Khallador to the north marches its blood magic fueled armies to Ceneria, attacking the city-state. Rat, who Kylar thought long dead is revealed as the son of the Khaladorian God-King. It turns out Durzo has been hired by the God-king and he poisons the entire court and royal family at the wedding between Logan the king’s daughter. The Khalladorians ransack and take over the city, killing many of the royals and dragging Logan to a secret prison in the bowels of the earth. Kylar arrives too late and believes that Logan has been slain. He then goes and confronts Durzo, stealing a magical artefact that allows him to use his magic but at the same time finding himself trapped in a battle to the death with his master. His magic able to flow freely, Kylar beats Durzo but is forced to kill him other than be killed himself. Hurting once more, Kylar has completed one stage of his character development and had become a full wetboy and is in possession of a powerful magical artifact that will help him shape his world. Now however, as Way of the Shadows leads into the second novel in the Night Angel trilogy Kylar finds his nation taken over by hostile invaders and his friends dead or captured. Thus his development, must continue as he changes to suit the altered world. ← Bringing the Blog back and Blogging 101.